At Christmas, we all look forward to the annual gathering of family and friends, yet the day itself can be frenetic with all that present opening (if you’ve been good), cooking and hospitality. The key to enjoying the day is planning, according to Mark Dawson, Head Chef at Dine. Here are his top tips to spice up your festive feast. Make your festive fizz extra special. Rather than adding the usual orange juice, try adding some sloe gin or Brontë Liqueur for a drink that really says ‘Yorkshire’. 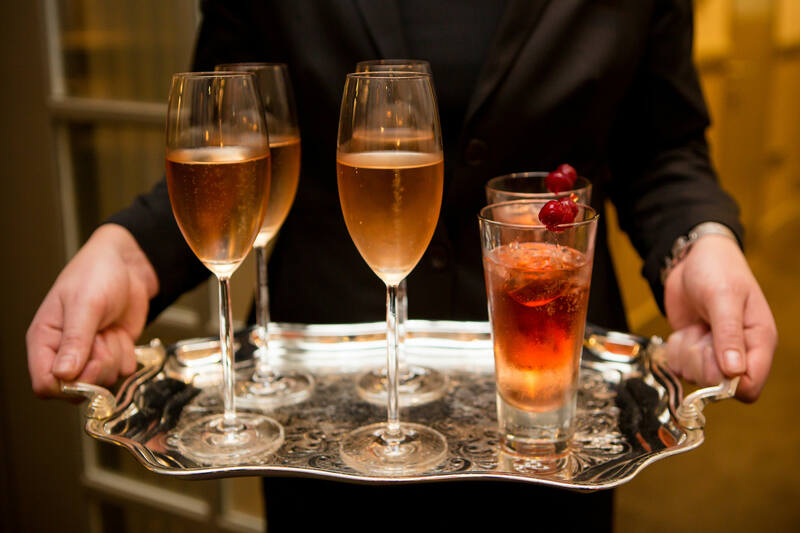 Simply add to the bottom of your champagne flute and top up with the chilled fizz of your choice. 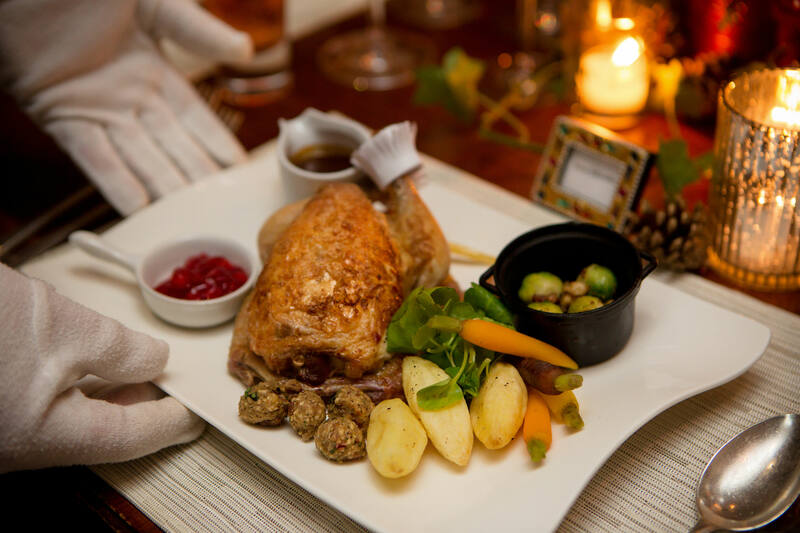 Whether you choose a traditional turkey, a retro goose or something entirely different – venison or nut roast anyone? – aim to choose the best quality you can afford. If you know which farm your meat came from and how it was raised, even better. We have no shortage of amazing food producers in Yorkshire, so there’s no excuse. Smother your turkey breast and legs in butter and seasoning and roll them in cling film (6 times). Bake them in the oven for 2 ½ hours at 170 degrees. For bacon lovers, you can crisp your bacon under the grill to finish. Whichever meat you choose, make sure you leave it to rest for at least 30 minutes before serving for the best flavour. Christmas goes hand in hand with British seasonal vegetables – roast potatoes, brussels sprouts, parsnips and carrots are all a traditional part of the meal. The good news is that they can be prepared well in advance and refreshed when you need them by adding fresh herbs, butter and seasoning. Why not get the whole family involved on Christmas Eve and peel and chop over a glass of something festive? Love them or hate them, Brussels sprouts are a long-established part of the meal but there’s nothing worse than a soggy sprout so make you sure you only boil them until they are still slightly firm and full of colour. To finish they should be sautéed with butter, walnuts and pancetta. Avoid flavourless root veg by par boiling and oven roasting them with a touch of balsamic vinegar, butter and seasoning. Or – if you’re running out of room in the oven – try them honey glazed by simmering gently with a knob of butter, a tablespoon of honey and a tiny amount of water. When tender, add balsamic vinegar and thyme. For crispy on the outside, yet fluffy roast potatoes, always par-boil them (for around 12 minutes – dependent on size). Strain water and bash slightly until the edges are fluffy. Heat the oven to 200°c and roast in hot goose fat for the best flavour. A few sprigs of fresh rosemary are always a nice decorative addition. Parsnips – hope for some hard frosts before Christmas. The cold turns some of the root’s starches into sugar for a tastier flavour. Always par-boil parsnips before putting in the oven with a little orange zest and fresh (not powdered) ginger for festive flavour. Some say (and I agree), that it wouldn’t be Christmas without lashings of gorgeous gravy and the opportunity for seconds! Save time and hassle on the day by making your gravy in advance. Simply roast the bones at 200°c for one hour before putting them in a slow cooker with root vegetables, celery, leeks and an onion and leaving this to cook slowly overnight. The following morning, strain the juices and add a spoonful of flour to thicken. A top tip is to stir in redcurrant or cranberry jelly to the gravy. It really pulls the finished gravy together and makes it extra festive. The stuffing and any sauces can also be made well in advance and reheated at the last minute. 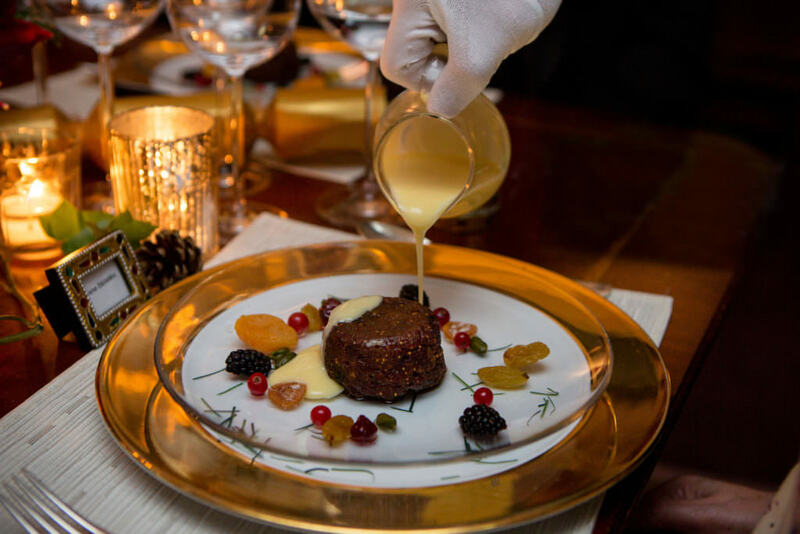 You may want to keep it traditional and go for the Christmas pudding option – click here for our recipe (recently featured in the Yorkshire Times). 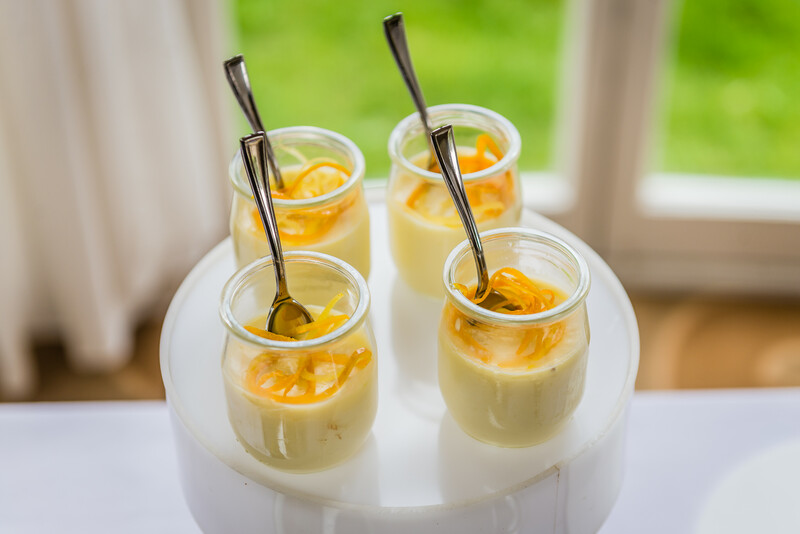 Alternatively you could opt for a dessert that will cut through the richness of the meal; we love a zingy Lemon Posset, served with shortbread or a brandy snap. Place the sugar and cream into a pan over a low heat and bring to the boil slowly. Boil for around three minutes before removing to cool. Add the lemon juice and zest of the two large lemons. Whisk for a few minutes , then add the mixture to serving pots or glasses. Put in the fridge overnight (or until set). To finish, add some candied lemon zest and we will often serve with a shortbread biscuit or a brandy snap. A really quick and simple pudding, that’s bound to be a crowd-pleaser. Wishing you a Merry Christmas and a Happy New Year from all the team at Dine!